Americans believe that the 1945 bombing of Hiroshima and Nagasaki , which killed 200,000 Japanese, was meant to save more lives - even when historians suggest other motives were in play. Why is there such persistence in these kind of national beliefs? It is late August, and the US has just passed through its annual revisiting of the atomic bombings of Japan in 1945. Newspaper and television reports once again recounted how president Harry Truman decided to use an atomic weapon against Hiroshima on Aug 6, 1945, and a second one against Nagasaki a few days later. These two weapons killed 200,000 Japanese and left countless others with dreadful lingering injuries, but - the reports point out - they brought World War II to an end more quickly, and saved far more lives as a result. Informal conversations in the United States on the subject tend to mirror this view. It is the very sameness of these retellings that give pause for reflection. While new details about the bombings surface every year, the general outlines of US memory of the events have remained remarkably consistent. So consistent, in fact, that they may reveal more about the need to ratify an underlying national narrative in America than about the reasons for what happened in Japan seven decades ago. The standard US account of Hiroshima and Nagasaki repeats that Truman decided to use atomic weapons in order to shock Japan into prompt surrender in order to save perhaps a million lives. There is little mention of any other possible motives, or of any other countries' involvement in bringing about the end of the war. It's a stripped-down version of events that most Americans have come to accept as accurate and complete, but the fact that the nation feels compelled to revisit this memory every year, re-asserting the standard account of Truman's reasoning, is interesting. Tellingly, it doesn't take much to bring out American defensiveness about it. 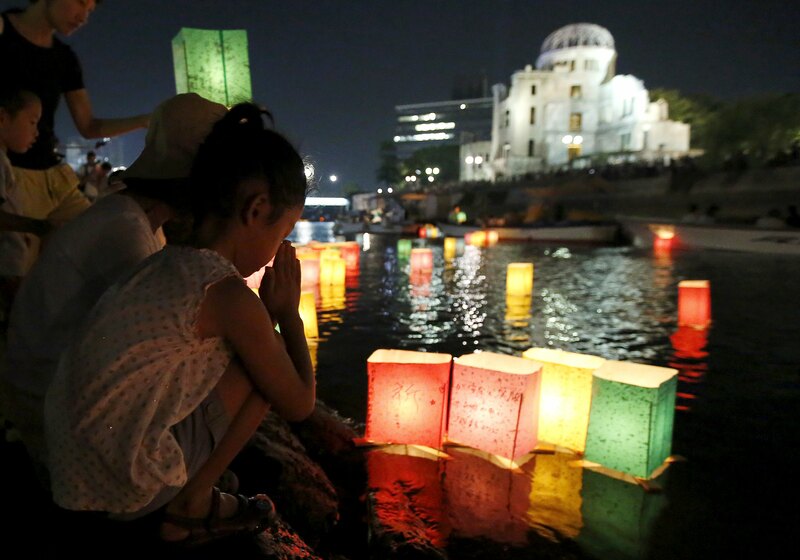 Japanese releasing paper lanterns on the river facing the Atomic Bomb Dome in Hiroshima on Aug 6, the 70th anniversary of the US bombing of the city. Another atomic bomb was dropped on Nagasaki a few days later. This becomes apparent when Americans are confronted with alternative accounts - and routinely respond to them by rejecting them out of hand. Such alternatives do exist, however, both in the collective memory of other nations and in the writings of Western historians, including several Americans. Russian memory, for example, takes it as axiomatic that the American use of atomic weapons had nothing to do with shortening the war with Japan. Instead, it holds that the bombs were intended to threaten the Soviet Union into curbing the attempt to build a sphere of influence and security in Eastern Europe. Regardless of whether or not one believes the US threat succeeded, in the Russian account the intent was clear. Russians also point out that before the bombs were used, the Soviet government had communicated to Japan that it would no longer help negotiate a truce and had joined the Allies in demanding unconditional surrender. This meant Japan faced implacable opposition on all sides, and the end was inevitable. And they note that Joseph Stalin lived up to his promise to the Allies to launch a massive August offensive against Japanese forces in Manchuria. In short, most Russians view the idea that the US used atomic weapons to end the war with Japan as false, even risible. Several American historians have similarly questioned whether the atomic bombs forced Japan's surrender. They cite documents showing, for example, that emperor Hirohito and other leaders had decided that continuing the war was futile before Hiroshima was bombed and had made the decision to surrender before they knew of the devastating effects of the bomb in Nagasaki. Furthermore, there is evidence that Truman was quite aware that he could use the monopoly on atomic weapons to intimidate his Soviet counterpart, Stalin. due to some kind of top-down censorship efforts by the US government and media? This is the first thought that springs to mind for many commentators, especially those from other countries. In today's highly connected world, however, censorship is hardly a convincing explanation. So what could explain this steadfast American commitment to the standard account of Hiroshima and Nagasaki, essentially unaltered since it was rolled out immediately after the events themselves? I believe we need to look at deep cultural forces that bubble up from everyday life to frame collective memory. What I have in mind is an underlying national narrative template that presents America as a beacon of liberty or a "city upon a hill" for others to emulate. It is often hard for people from other societies to believe the power of this narrative, but it has been successfully harnessed by political leaders from Abraham Lincoln to Ronald Reagan, George W. Bush, and Barack Obama to mobilise the American public. As is the case for national narrative templates everywhere, it operates at an unconscious level, thereby giving it even more power to shape memory. In contrast, serious historical inquiry harnesses rational, objective, methods to consider all evidence, including that which contradicts existing accounts. Rigorous inquiry may even call into question a deeply held underlying narrative. But collective memory tends to do the opposite: Preserve narrative at the expense of evidence. Contemporary research in cognitive science suggests that it does this by harnessing unconscious, "fast thinking" in the form of what might be called a "didn't-couldn't" construction: Things didn't happen [in the way described in alternative accounts] because they couldn't have. Because believing anything else would shake the foundations of political culture. The bedrock narrative undergirding American deep culture suggests that the US would not have used atomic weapons against civilians unless it had a very strong, humanitarian justification for doing so. Any other motivations didn't play a role because they couldn't have played a role for a nation that strives to be a shining city upon a hill, an inspiring destination for the rest of humanity. This does not mean that the American account of Hiroshima and Nagasaki is simply false and others are true. It also does not mean that national narratives in general have no truth to offer. To be sure, accounts of the past may involve falsification, omission, and outright lies. But things are usually not so simple because the deeply engrained narrative habits of the national community operate in more subtle ways. We cannot escape such bias, but we can manage it. First, we can insist on historical scholarship that faces all the facts, including uncomfortable ones. Such scholarship should be so committed that it is willing to sacrifice an existing, deeply held national narrative. Second, we can all try to maintain a degree of humility when it comes to challenges to our beliefs about the past. This could involve, for example, reflecting on whether we unconsciously interpret the question, "Why did the US drop the bombs on Hiroshima and Nagasaki?" from the implicit perspective "How does this event fit what I need to believe as part of our national narrative?" If not subjected to reflective control, the pieces snap into place in the blink of an eye, and the result is validating and gratifying. There will always be a need for a coherent account of the past in order to function as national communities, but we need to remind ourselves that we can also recognise the limitations of reflexive habits that play such a powerful role in guiding our views. If these two practices were given more emphasis, the annual August discussions of Hiroshima and Nagasaki in the US might be more conducive to the kind of open, insightful discussion that leads to new perspectives. Then Americans might be less likely to dismiss other versions - or to have theirs similarly dismissed by others. in St. Louis. He is also a guest professor at Fudan University in Shanghai and a member of the Russian Academy of Education.